uTorrent has long been regarded as the de facto app for torrenters far and wide. Created by none other than BitTorrent itself, it used to pride itself on being lightweight, functional, and easy on resources, but in recent times, it has been riddled with ads. This, alone, isn’t unacceptable, since a piece of software as ubiquitous as uTorrent needs to be funded in one way or another, but the latest edition, version 3.4.2, has taken things to the next level by installing a cryptocurrency mining app by the name of EpicScale. Once installed, EpicScale will eat away at your resources to mine for digital currency, and so naturally, the arrival of uTorrent 3.4.2 has caused uproar in the torrent community. Indeed, many private torrent trackers have banned the current build with immediate effect, and while BitTorrent has defended the Litecoin mining – claiming that users are prompted before EpicScale’s installation, some users claim that the app sneaked into their systems without stated consent. The reason why this is more significant than your typical piece of adware, is because in mining for Litecoin, EpicScale greatly ups a system’s processor load. This puts added strain on the hardware, and while adding a little extra to your electricity bill, may also shorten the lifespan of your computer in general. Step 1: In the Control Panel, remove the EpicScale program using the traditional method. Click on Program and Features, then locate EpicScale and then click on the Uninstall button. Step 2: Since it doesn’t completely uninstall even after you’ve hit the Uninstall button, you’ll also want to navigate to C:\ProgramData\ and delete the EpicScale folder. If it is hidden, navigate through Organize > File and Folder Options to enable hidden files. Step 3: Press and hold the Window key + R to launch Run, and type “regedit” without the quotation marks. Step 4: Once the Registry Editor is open, look for the EpicScale key under HKEY_CURRENT_USER\Software and remove it. Step 5: Just to be safe, ensure that there isn’t a further EpicScale key under HKEY_CURRENT_USER\Software\Microsoft\Windows\CurrentVersion\Run. If there is, then get rid of it. Many are ditching uTorrent in their droves, as you’d expect, and as such, you may want to seek out an alternative. qBittorrent, Deluge and Transmission are just a few of the many that don’t install any unwanted junk, so we’d recommend doing away with uTorrent for good and trying one of them out. On a diffirent note, I think its a good stance for @Abst3rg0 to show us how to remove this. Thanks. 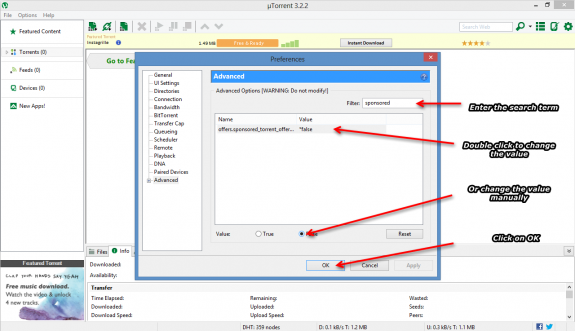 You may have read about BitTorrent including ads in their popular torrent client recently. Not everyone were pleased with this decision. Fortunately disabling these ads is just a few mouse clicks away. And the best part is you don’t need any additional software to do this. That’s right , we can disable it from within the app. typing the following text to access the settings for it. false. You could also set the radio button to false and click OK.
Now close and re-open uTorrent. No more ads in the interface. If you still have a banner ad at the top of the screen, see the next step below. and set it to "0" (numerical zero), or you can use U+200C from windows character map (arial selection) and paste it in the settings a few times. If this post helped you, drop a comment below.